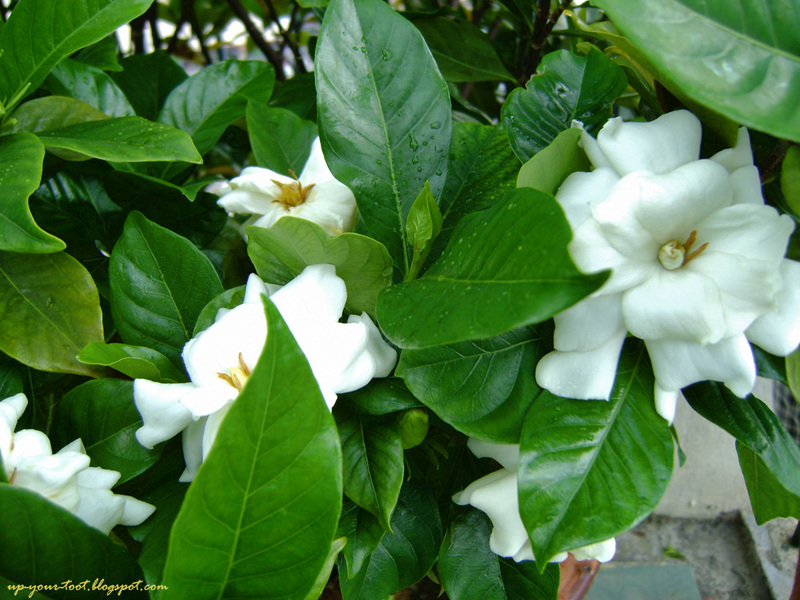 One of the fragrant flowers that one should have in the garden is Gardenia jasminoides. With glossy dark green leaves and dark greyish-brown bark, this handsome plant produces either single or double-petaled blooms that have a lovely scent. Gardenia jasminoides or Cape Jasmine has many synonyms including G. augusta or G. florida and this plant is known as 栀子花/梔子花 in Chinese. The flowers are white, or off-white that may turn light yellow as the blooms age. Cultivars with blooms that turn yellow rapidly exist, such as ‘Aurea’ or ‘Golden Magic’, thus giving the effect of a yellow gardenia. Once the blooms are spent, they look like wads of tissue paper that had been thrown onto the plant. I did have a friend in university who where puzzled as to why students are so un-civic minded and were throwing used tissue paper on the gardenia hedge that was planted around the faculty building. Only when pointed out that those were the withered blooms of Gardenia jasminoides did she realised what it was. As the flowers of Gardenia jasminoides age, the petals flatten out and eventually look like a wad of white/off-white tissue paper stuck on the plant. After the blooms, small oval-shaped blooms may follow, and this fruit is used in Traditional Chinese Medicine as well as to extract a usable yellow dye for food and clothing from it. The yellow colouring extracted from Gardenia fruits is called Gardenia yellow and can be used to colour ice-creams, candies and jellies. Besides saffron, Gardenia fruits represent another rich natural source of crocin, a carotenoid responsible for the intense orange colour of saffron. The white flowers of Gardenia jaminoides contrast sharply with the dark glossy leaves. I got the Gardenia as a discarded trimming of the hedge at the university. When the cutting has rooted, I left the pot on the garden (this was in Kajang, and I had a small garden on the front yard). The roots grew through the pot and the pot plant eventually became a tree that birds and even bees made nest in! From this tree, I gave cuttings to several people. Cuttings, especially younger ones, are easy to strike. The plant likes moisture but hates to have ‘wet feet’. Any water-logging (including putting a tray to catch water beneath the pot) would eventually result in root rot and death of the plant. A pair of Yellow-vented Bulbul (Pycnonotus goiavier) fledgling perched in the cover of a huge Gardenia jasminoides bush. 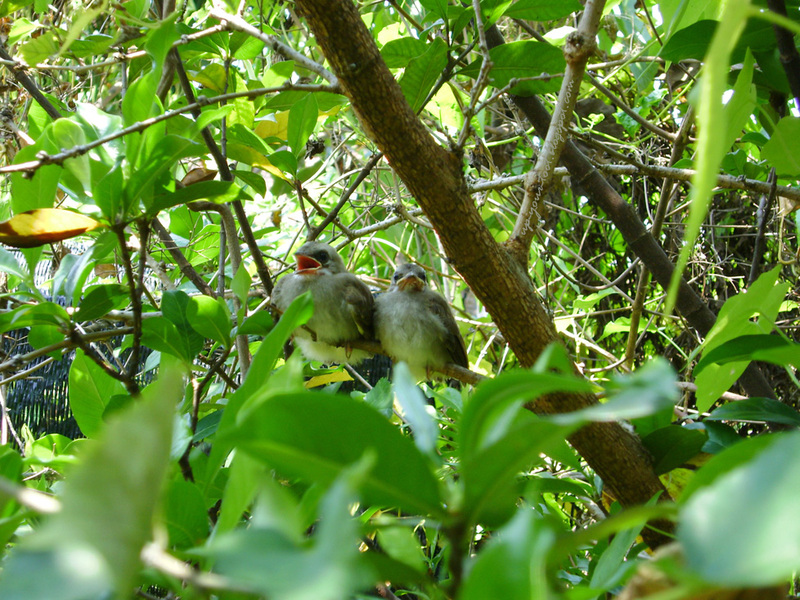 They are perched on a mulberry branch under the cover of the Gardenia leaves. 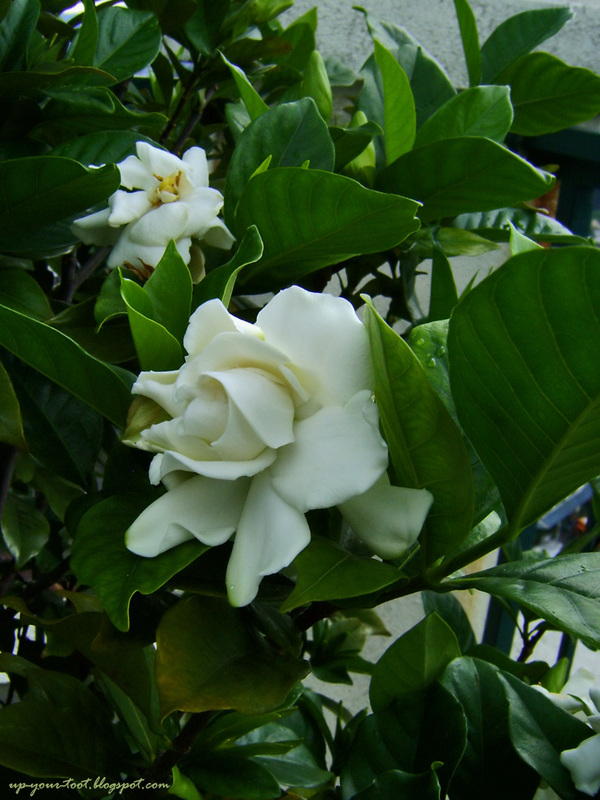 As Gardenia requires acidic soil, growing Gardenia in soil with high pH would result in chlorosis of the leaves. This is the result of impaired micronutrient, especially iron are impaired under high soil pH. Gardenias love light and usually filtered sunlight would suffice, but established plants can take full sunlight. My old Gardenia ‘tree’ gets a full day’s sun (east – west orientation) and the bush at J & A’s balcony also receives full sunlight. As long as there is enough moisture, a matured shrub would be very happy with as much sunlight as it can get. The scent of Gardenia jasminoides flowers, despite smelling very strong, does not travel far unlike those of Jasminum sambac. Hence to smell the flowers, you probably got to cut the blooms and bring it in, whereas the smell of Jasmine travels with the breeze well, and leaving a balcony door open would suffice. Beautiful flower. Some thought cross my mind, is it just coincidence that white blooming flower is usually very fragrant compare with other colours. You know macam bunga jasmine (melur? ), kemboja (selalu dekat graveyard), harum sundal malam, ylang ylang,ect. It is, but due to the white colour, it is very much less appreciated. Yup, sebab terpaksa guna haruman to attract pollinators since it is white and have no attractive colour. Menarik juga tu since the colour attract less pollinators, it attracts them by scent. Very unique way of attracting pollinators. One always think about the visual beauty (eye) but never thought of the other sensory system that animal possess. Pandai juga plants ya how they evolve. Yup, plants are amazing...ada yang menarik sang lebah dan rama-rama. Ada pula dikunjungi kupu-kupu, semut, kumbang dan juga binatang seperti burung kelicap dan kelawar. On top of that, white flowers are normally more fragrant at night. Pollinators of white flowers are night time creatures like moths who can't see a lot of color at night so color wasn't necessary when adapting. Colorful flowers are supposed to attract day time animals. Because day time pollinators can easily see in sunlight, scent wasn't important. . 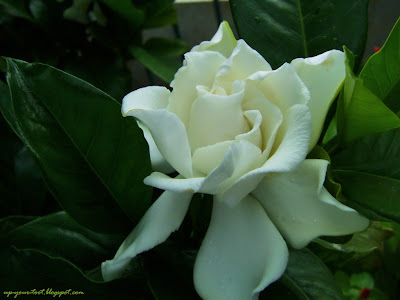 The gardenia flowers are lovely and they look like white roses. I'm thinking of transferring mine from the pot to the ground. Yeah, I just wish that they have more colours. If the pot is large, they should be fine. But they look good as a hedge or a huge shrub too.